By Diana: The newly installed statue of the suffragette Emmeline Pankhurst inspired members of Glossopdale WI to a rousing rendition of Jerusalem. It stands in St Peter’s Square. Apparently Queen Victoria is the only other woman with a statue in Manchester! 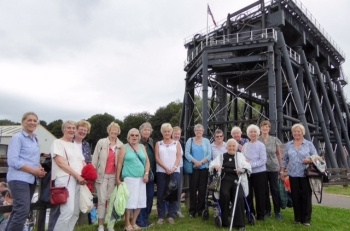 By Diana: The Anderton Boat Lift, a masterpiece of Victorian engineering near Northwich in Cheshire, was the destination for a study tour for Glossopdale W.I. The tour included the excellent on-site exhibition and an expert commentary on the ride on the boat lift itself and the trip along the River Weaver. The Anderton Boat Lift was constructed in 1875 to improve the flow of goods between the River Weaver and the Trent & Mersey canal. Salt from the Cheshire mines was shipped along the river to be exported via the port of Liverpool. Pots from the Staffordshire potteries were shipped along the Trent & Mersey canal and thence to Liverpool. The Boat Lift connected these important trade routes: with its 2 caissons the Lift could raise the boats arriving from the river to the level of the canal and simultaneously take boats arriving by canal down to the river. The original hydraulic system was replaced with an electric operating system in 1908, to cope with increased trade. However a subsequent drop in trade, lack of investment and patchy repairs led to closure in 1983 on safety grounds. After a public campaign money was raised for a complete restoration using the original hydraulic system and the Lift was re-opened in 2002. It now provides an enlightening and enjoyable tour, much appreciated by our members. The next meeting of Glossopdale W.I. is 9.30-12 noon on Wed Sept 19 at Glossop Labour Club. Visitors are welcome. 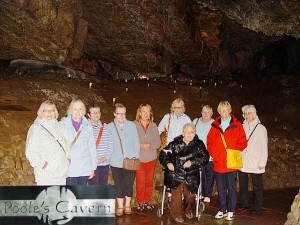 By Sara Jayne: Eleven members had a very enjoyable day out to Poole’s Cavern in Buxton on 9 July 2014. We had an early start – 8:30am – to avoid the swarms of schoolchildren scheduled later in the day, but getting the first tour meant we had the cave to ourselves, which was a lovely experience. Our guide was very knowledgeable and entertaining. He told us many stories, including the story of the most beautiful thing Mary Queen of Scots had ever seen, and he also shared with us that the 1666 date someone had carved in one part of the wall of the cave was (according to a school party) the last time England won the World Cup. After the cave tour, we had tea and coffee to ensure that the cafe was up to snuff (it was), and then planned out the rest of our day. Having emerged to a glorious day outside, one carload decided to hike up to Solomon’s Temple through the Woodland Trail; another carload decided to enjoy a fine lunch at the Old Hall Hotel; the last carload strolled through the Pavilion Gardens and greenhouse before enjoying a light lunch there. 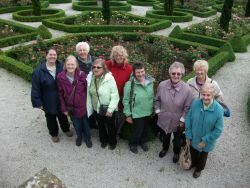 All in all, a lovely day out, with many thanks to Monica for her fabulous arrangements – especially the sunshine! You can see more photos from the trip in the photo album. 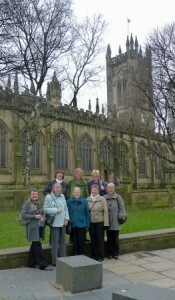 By Sara Jayne: Glossopdale WI members were in Buxton on 19 June 2014 to celebrate the arrival of the Centenary Baton, which is being relayed through every county and island federation in England and Wales in advance of the National Federation of Women’s Institutes’ Centenary in 2015. Derbyshire’s week to host the baton came one-third the way through its travels through England and Wales. In Derbyshire Federation [pdf], the baton has been fired over Creswell Crags, heard an organ recital in Chesterfield’s Crooked Spire church, met the Duke and Duchess of Devonshire, seen The History Van serve up Suffragette lunches, been passed between members representing 10 decades of the WI at Long Eaton Carnival, made an appearance at the Derbyshire County Show, wound its way through several other villages and towns, and was handed off to Staffordshire Federation at the National Arboretum. It travelled over 200 miles through Derbyshire in its 8 days here! 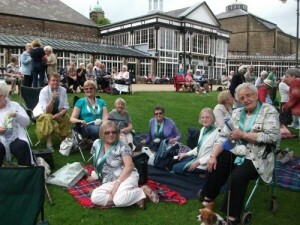 At this celebration in Buxton, we brought picnics and celebrated the camaraderie of the WI while we awaited the baton’s arrival. We enjoyed the festive atmosphere created by our bunting, banners, sashes, hats, and also the Tideswell Male Voice Choir, which was in top form! The baton arrived from Chesterfield on a vintage tractor, and was handed to the longest-serving member of Chinley WI, the oldest WI in Derbyshire, on the bandstand in the Pavilion Gardens. The Town Crier read a proclamation about the event, and of course, we sang Jerusalem. 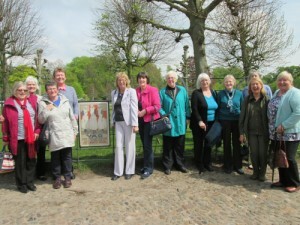 By Joan: In May 2014 several of our members visited Dunham Massey Hall which was recreated as Stamford Military Hospital. It was one of the many hospitals created to treat wounded of the First World War. Each room told stories of real patients and staff with actors providing an insight into the human side of the hospital. The visit was interesting, but left you feeling emotional, horrified and amazed, but most of all proud of what these soldiers, staff and families went through. 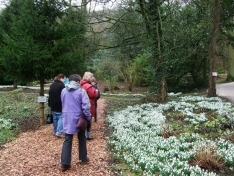 It was nice to follow this visit with a walk through the beautiful grounds. The “Photos” section of the site contains more pictures. 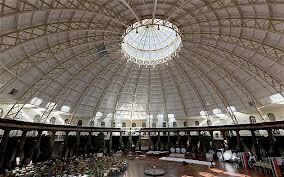 By Joan: On Wednesday the 12th September 13 of our members visited the Devonshire Dome in Buxton. Once a magnificent 18th Century stable block built by the 5th Duke of Devonshire, to house the horses and servants of the guests of the Crescent Hotels, this Grade 2 listed building was also used as the Royal Devonshire Hospital and is now a campus of the University of Derby. The slate dome erected by Robert Rippon Duke in 1882 is the largest unsupported Dome in Britain. It was interesting to hear about the changes to the building and the construction over the years. The visit was followed by an enjoyable lunch at the Pavilion Restaurant.